Yesterday, Japan Airlines (JAL) has successfully launched their first new route after it re-listed on the Tokyo Stock Exchange earlier this year. This 4 weekly 787-8 service to San Diego is the first ever non-stop scheduled flight linking Asia and San Diego, the 2nd largest city in California behind Los Angeles. A ceremony which include ribbon cutting was held at the departure hall of Narita Terminal 2 where the check-in counters are located. JAL Chairman Masaru Onishi was once again representing JAL at the launch of the new routes. Goodies bags were handed out to the inaugural flight passengers. The bags contain a boarding certificate of the inaugural flight, a special pouch by Kitamura which is from Yokohama, the sister city of San Diego, and pastries from Narita using local produces. The inaugural flight was almost full with 185 passengers, including 2 infants, onboard (vs. capacity of 186). After a final walkthrough of the 787-8, registration number JA827J, conducted by JAL mechanics and Chairman Onishi who was a JAL mechanic before and joked that he wants to listen to the engine noise up close, flight JL066 departed 2 minutes ahead of schedule at 17:08 from Gate 62. JAL staffs waived goodbye to the crew and passengers. The flight arrived San Diego on time at 09:57, within 15 minutes of the scheduled arrival time of 09:45. It was greeted by water cannon salute at San Diego. JAL inaugural flight JL065 from San Diego to Tokyo Narita took off. Image from Japan Airlines official Facebook page. 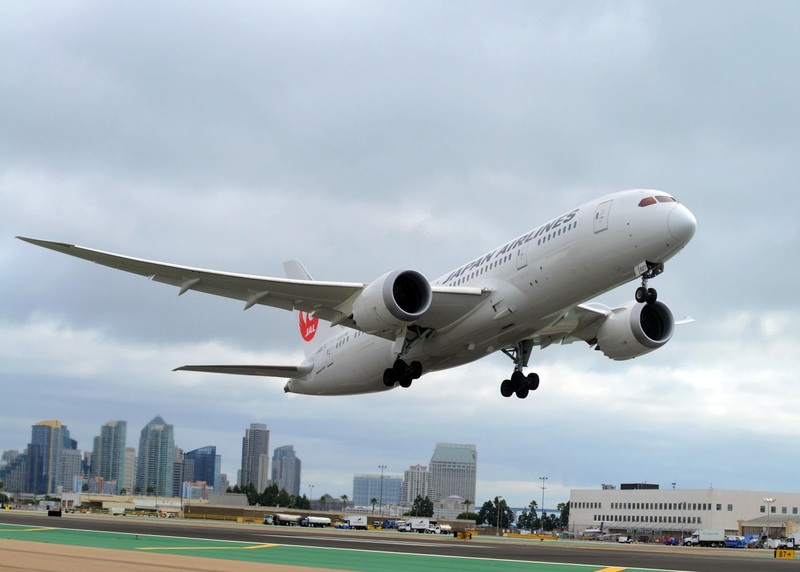 At San Diego, a similar ribbon cutting ceremony was held and JAL President Yoshiharu Ueki represented JAL this time. The inaugural flight from San Diego to Tokyo Narita, JL065, was delayed and didn't depart from San Diego Gate 20 until 12:03, 33 minutes after its scheduled departure time. The flight arrived Narita at 17:01, 31 minutes after its scheduled arrival time. Right now JAL is offering 4 weekly service to San Diego and will expand that to daily service from March 1 2013. Other than the AIR KFC JAL has prepared for the economy class passengers on the San Diego bound flight, JAL will also offer special menus during the launch period till February 28 2013, which include some Mexican dishes as Mexican cuisine is popular in San Diego. And JAL is offering double mileage campaign on this route as well. So definitely a good time to try out this new service! Although the inaugural flight departed from Gate 62, looks like JL066 will be using the satellite building instead. December 3's flight departed from Gate 93. Now it makes sense for JAL to extend the JAL First Class Lounge operation hours at the Satellite Building as it probably expects more top tier passengers will be using this flight.